At least seven policemen and two protesters were hurt Thursday in a clash after villagers in northeastern Cambodia blocked a national highway to protest being forced off land they have occupied for at least two years. Land disputes became a critical issue in Cambodia in the early part of last decade, as great blocs of land were granted as concessions for logging, rubber, and other economic development projects. Violent and sometimes fatal conflicts between villagers, who rarely held formal land titles, and the authorities, acting on behalf of the concession holders, became common to the point that they were considered to be a threat to political stability. 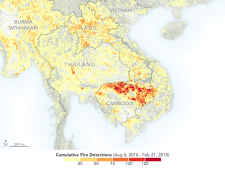 Yet again, the Kingdom this year burns brighter than its neighbors, with fires in Cambodia being detected from space at a much higher rate than any other country in the region, according to a NASA report published last week. It’s likely a product of both naturally occurring blazes and also those caused by land clearing, especially on concessions. 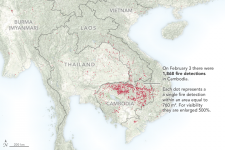 Fire season, which runs from January through March, but can extend as late as May, reached its 2018 peak on February 3, when NASA’s Earth Observatory picked up some 1,868 active fires in Cambodia. That compared to 217 in Thailand, 185 in Laos, 114 in Vietnam and 77 in Myanmar. Chea Sam Ang, head of the Environment Ministry’s General Directorate for Administration of Nature Conservation and Protection, said annual fires in deciduous forests are a natural occurrence, burning surface debris, and grasslands, but leaving large trees unharmed. 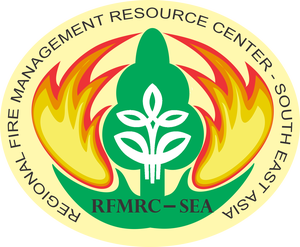 Simon Mahood, Wildlife Conservation Society–Cambodia senior technical adviser, agreed a portion of the burning is a natural part of the ecology. 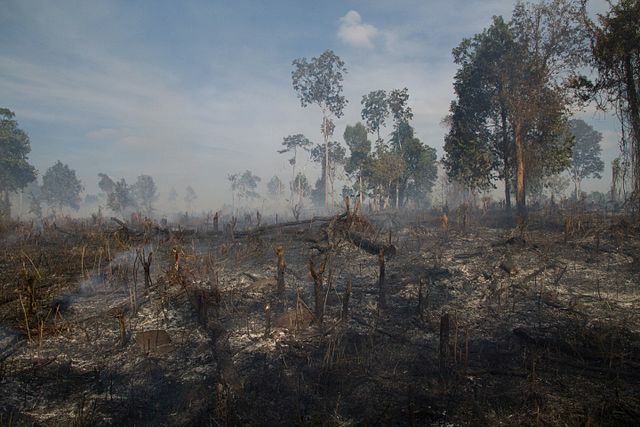 While many fires are from slash-and-burn agriculture, hunting, foraging and resin collection, as well as land grabbing, land clearing on concessions is the key factor, Sam Ang said. There is also a correlation between logging and forest fires, according to NASA’s report. 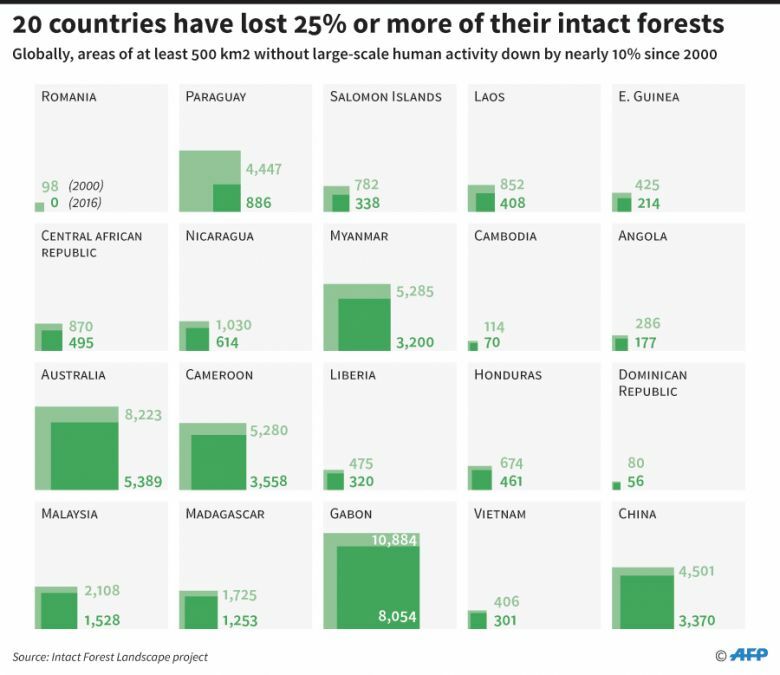 “Loggers use fire to clear roads and to clear the land after harvesting the most desirable species,” they wrote, noting that without information on the ground it is impossible to determine what caused a given fire from the satellite imagery. 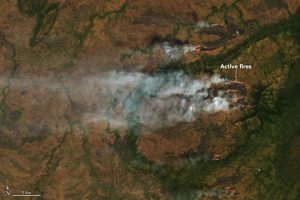 This wouldn’t be the case in evergreen forests – such as in Virachey National Park – where hardly any fires are observed, Sam Ang and Mahood said. Sam Ang added that fires are “not a priority” issue, though the ministry monitors and works with local villagers on fire education. Forest patrollers and rights groups are questioning why the Oddar Meanchey Forestry Administration has yet to take action after a soldier transporting illegal timber allegedly beat and threatened to kill a patroller last month. Patroller Loeut Las and Sorng Rukhavorn community forest chief Venerable Bun Saluth say they have filed complaints with local representatives of the rights groups Adhoc and Licadho in hopes of bringing the suspect to court. Community forest patrollers say Regiment 424 soldier Moeng Duong hit Las and threatened to set his family on fire last month after being caught allegedly transporting luxury timber. Forestry Administration officials who were at the scene of the confrontation have confirmed the account. However, when reached yesterday, provincial Forestry Administration Director I’m Savarith said the agency needed more time to investigate. He declined to say when the investigation would end before hanging up. Regiment 424 commander Sin Pean could not be reached for comment yesterday, but told The Post earlier this week that he had punished and “educated” Duong. Saluth and Las sent a report to the provincial Forestry Administration shortly after the incident, which took place on January 28. Srey Naren, a provincial coordinator for Adhoc, said he plans to file a complaint with the court next week in hopes that they can spur action.